Halloween Can Be A Scream! Decorating for Halloween not only involves finding a fantastic costume, but adding the right holiday decorations. Yes, Halloween can be a scream with fun décor. 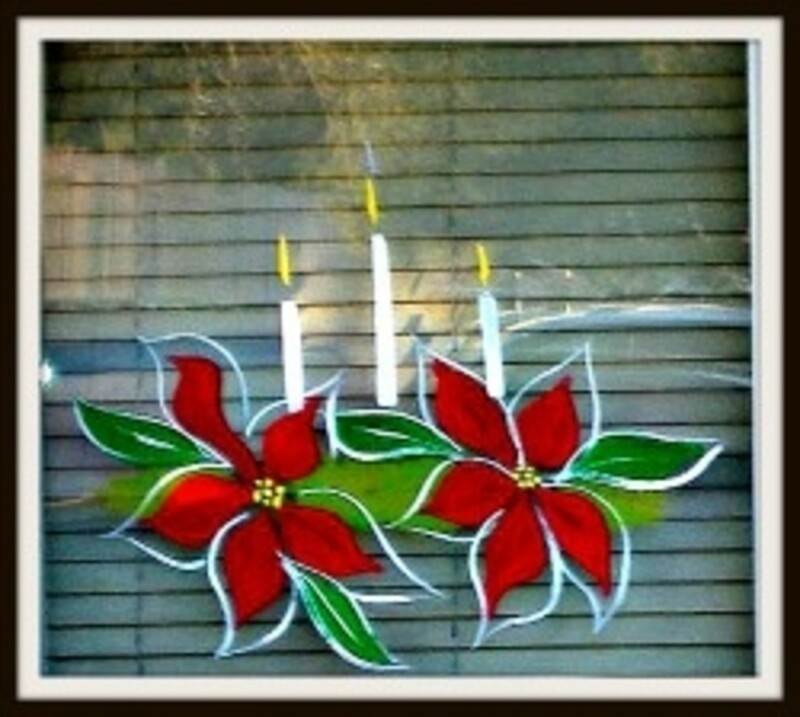 For me, decorating revolves around window paintings. I love to use Halloween accents around my front door and inside my home to greet those trick-or-treaters large and small. Halloween characters and images are so very colorful and fun. Painting spiders, bats, witches, and webs makes me giddy. I especially enjoy painting silly faces on odd shaped pumpkins and turning them into painted Jack O' Lanterns. 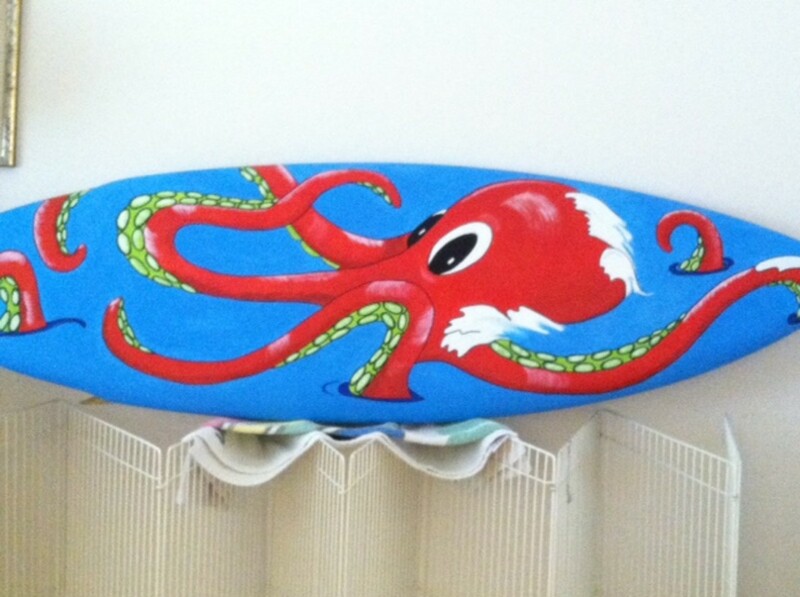 I can't help but laugh when a design comes to me I can share in my painted art. Eerie Ghosts, Elegant Vampires, and Flying Witches are fabulous decorations for Halloween. For a softer decoration that will compliment both Thanksgiving and Halloween do a Fall theme with just a scattering of colorful leaves. Do you want your yard and doorway touched with warm, friendly fall décor or would you like it to be a haunted house of sorts with screams of delight emanating from both trick-or-treaters and fun audio toys? How do you want to greet your trick-or-treaters when they come a-knocking? This is the only Halloween picture I can locate at this time from my portfolio. When I DO find the rest of my photographs you betcha I am going to share them. 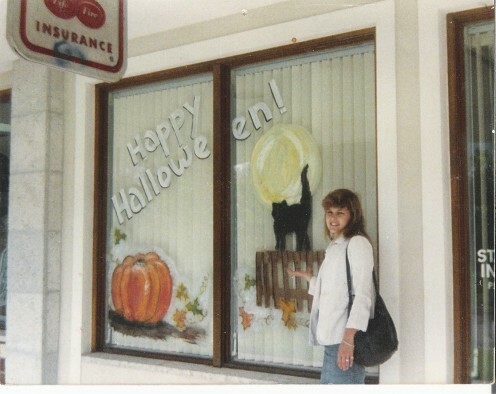 I will break down each section of this photo and briefly explain how Halloween window painting is done. Halloween images are predominantly black, orange, white, and purple. This color scheme will be sufficient to create many different characters for Halloween. 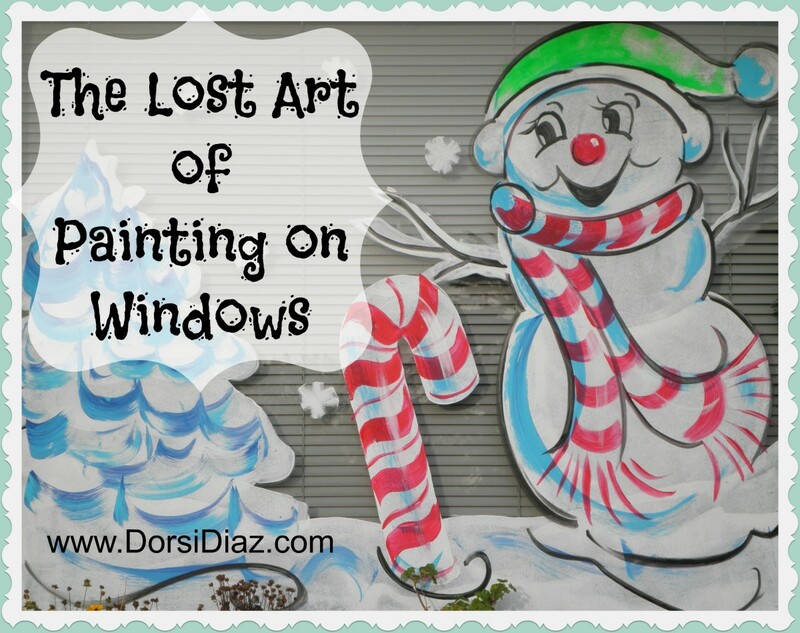 A few additional colors will help you add final details and touches to your window painting. This is a good list of Tempera colors to have ready for painting Halloween and Fall themes. When you use darker colors you should add something in the background that shows a contrast or you will lose your image in the painting. The moon here with the black cat allowed for the cat's spiky fur to show in the overall design. I didn't want to outline the cat here because I felt it was necessary to leave it solid. You can also see how to break apart a greeting that will not fit completely on a single window pane. The letters are block shaped with a black shadow to them. Painting them smaller would not allow them to be visible from far away. Make sure that your greetings are readable and clear from a distance. If you want to mix your own colors then buy the primary colors and test out your own tints. For an easier painting experience, buy colors already premixed. You can find many great colors to choose from. This basic set includes the primary colors plus white and black, but trust me, you are going to need more paint. Pumpkins are a big part of not only Halloween but a Fall theme as well. When I get to paint fully decked out Jack-O-Lanterns I have a lot of fun. A close up of the corner of this painting shows texture created when using several brushes to fill in the color. ( I am sorry this is not a great picture. It is a scan of an image from 1988. 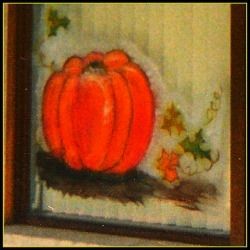 Yes, I have been painting that long and longer even than that...) I started here with a darker layer in orange then added a few highlights to the top of the pumpkin and then outlined it with a reddish orange. My pumpkins turn out different each time. Sometimes, I leave them in Fall style like the one you see here in the picture. I added a few Fall colored leaves in this design and some of those curling vines that grow with real pumpkins in a garden. 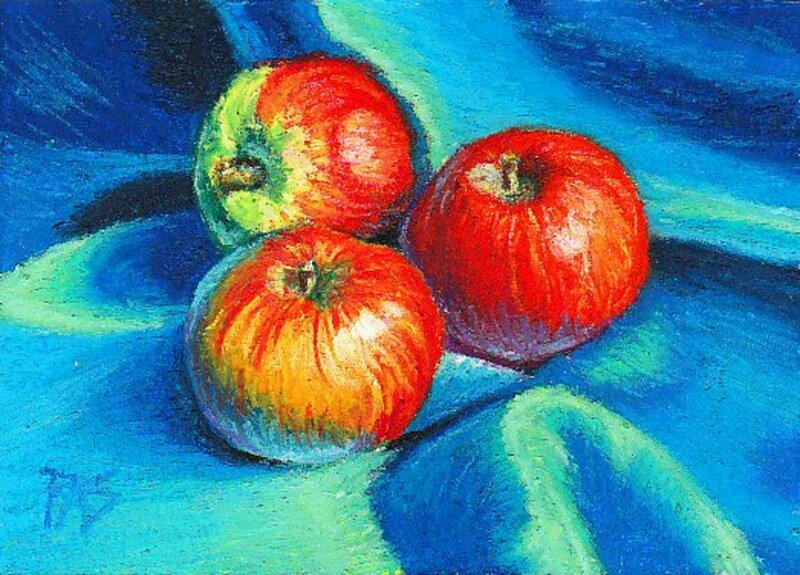 Quite often I paint them in oblong or tall shapes. When there is a lot of window space to work with a very large pumpkin patch is planted. A long held Halloween tradition are Jack-O-Lanterns. 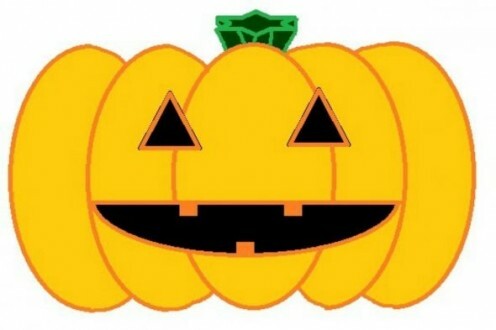 A Jack-O-Lantern is a pumpkin that has facial features or images. Carved to use as a light, a candle is placed inside and an eerie glow emanates from the carved out sections on the pumpkin. I like to mimic candlelight coming through my pumpkin faces and add details to them for Vampire faces or silly smiles. This image is an example of one of my Happy Face Pumpkins. 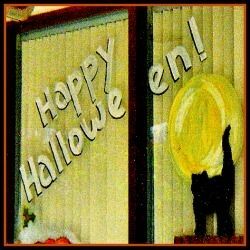 Halloween stencils are a great way to find a design to use for window painting. 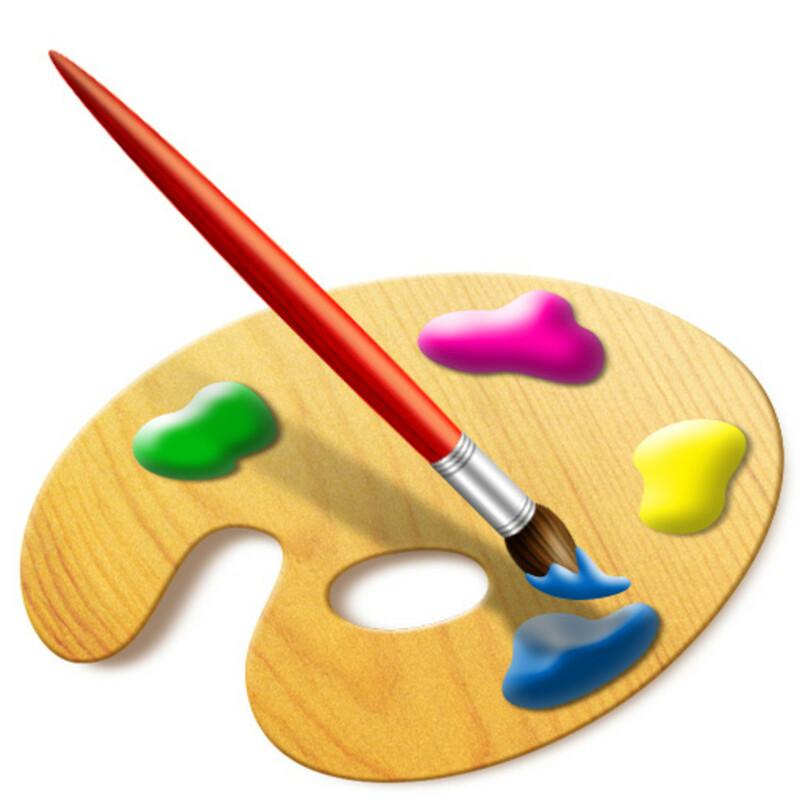 You can use various stencils to get your ideas from if you have a tough time with drawing. Take the smaller stencils and scan them into your computer and enlarge the image. Bats and pumpkins, ghosts, and black cats in stencil design make it easy to outline them on the window. Copy them to pieces of thick plastic and use them to paint through. These stencils below will help you find a neat pattern to use. Using a sponge brush to dab paint through a stencil is the easiest way to add color to your windows. Outline the spaces in a stencil using a stabilo pencil. Stencils are a great way to get started on a small scale.Using stencils are great for anyone who is unsure of their drawing skills but would still like to try to paint. This would be a great way to practice painting images. Using the stencils as examples, draw them out and color them in. There are many great stencils for use anywhere we can add a fun design! For me I would outline a stencil then remove it and fill in the design spaces with color. For painting through a stencil tape your stencil firmly to the window. Make sure your brush or sponge is not too wet or you will end up with runs or paint bleeding. Using very light coats of paint on a sponge or wide brush gently tap the color into the design spaces. Let each colored area dry before you move onto the next section. Outline the finished design. Tempera usually dries in about 5 minutes unless it is very cold. The drying time will be a little bit longer. Touch the paint lightly with your finger and if it is dry to the touch and no longer tacky you may add the next color in your stencil design. This image may be printed out for you to use as a template. Cut the image out of the printed paper and outline it onto your window. You may want to cut out the different sections and use them as individual pieces or just outline the entire design then fill it in with paint. Experiment with different sizes of pumpkins by outlining the top of the pumpkin as is then dropping the template down a few inches and draw the bottom of the pumpkin. Connect the lines in the body of the pumpkin and you have a taller image. Thank you! I have a blast decorating this way! Clever ideas! You can get a nice large decoration too that way. Looks great. I love this idea - great fun hub. @khatha0808: Keep on practicing! =) It gets easier! --- Thanks for stopping by and sharing your comment!